The Petersen Events Center hosted the third straight McConnell family reunion on Sunday afternoon, pitting head coach Suzie McConnell-Serio against her brother in the women’s basketball exhibition matchup. For the third year in a row, McConnell-Serio’s Panthers topped her older brother Tom McConnell and the Indiana University of Pennsylvania Crimson Hawks, 72-40. “It’s never fun when you’re opposite family members, coaching against them,” McConnell-Serio said. Last year, the Panthers won 75-60, led by 19 points from forward Brenna Wise. Despite winding up on the losing end again, McConnell enjoyed the chance to match up against his sister and the Panthers. 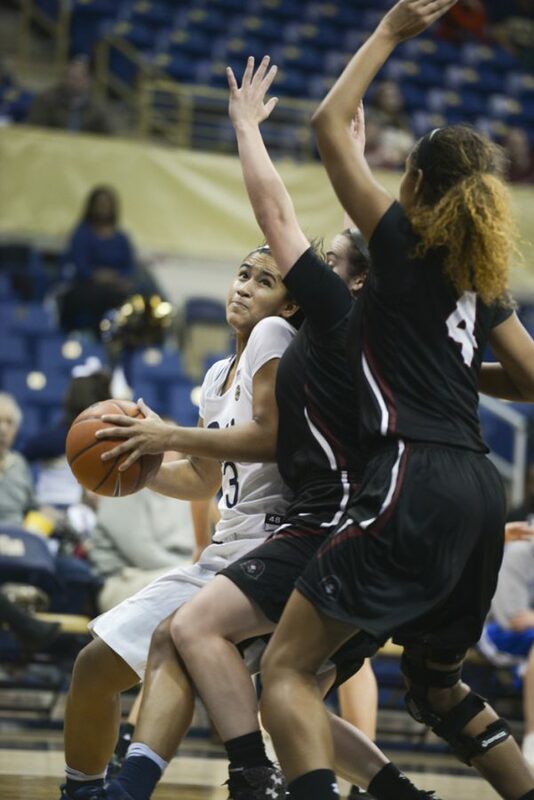 Pitt’s starting lineup featured two returning players from last year’s starting rotation and three new starters: First-year forward Alayna Gribble, sophomore guard Kauai Bradley and graduate transfer center Brandi Harvey-Carr. Junior point guard Aysia Bugg and Wise rounded out the starting five. Wise, Pitt’s leading scorer last year, got the scoring started with the first two points of the game. After that, the Panthers looked inside to their new 6-foot-4 center, Harvey-Carr. Pitt’s guards continued to pass the ball in the paint to Harvey-Carr. The graduate transfer took the next two shots for Pitt, missing the first but making the second while drawing a foul. Harvey-Carr made her free throw to increase the Panthers’ lead to 5-2. After that, Gribble –– playing her first game at the Petersen Events Center since winning last year’s WPIAL AAAA Championship –– decided to get in on the action. Next time up the floor, Gribble saw an opening from outside the 3-point line and drilled her first shot in a Panthers uniform. Shortly after, Gribble drained another 3-pointer –– this time with a hand in her face –– to start the game 2-for-2 from deep. Bugg started the game at the point, but first-year point guard Jasmine Whitney played 12 minutes off the bench in the first half. Both players split time bringing the ball up the floor, and each scored seven points in the opening half. The Panthers took a 32-20 lead into the break, but Crimson Hawks forward Alexiss Griggs made the first shot of the second half to cut Pitt’s lead back to 10. Another IUP 3-pointer closed the score to 32-25, then Pitt turned to Harvey-Carr to regain the momentum. Harvey-Carr made an easy layup for Pitt’s first points of the second half, then continued to show her strength in the post, ripping down a rebound and making a putback for another two. Her size advantage was evident throughout the game as she easily outworked and outmuscled the Hawks for rebounds and loose balls. The Panthers tightened up their defense and began to pull away late in the second half, coming out on top in a commanding 72-40 win. Harvey-Carr led the team with 13 points and 8 rebounds, while Gribble scored 12 points and forward Kalista Walters added 10 points and 7 rebounds off the bench. Pitt opens its regular season at the Pete against Mount St. Mary’s Saturday, Nov. 12, at 2 p.m.